The sell-off in Asian and European equities overnight kept currencies under pressure ahead of the North American trading session. Although most of the major currencies consolidated after yesterday’s losses, the sharp slide in Dow futures (which points to a lower open) suggests that the weakness could continue in NY trade. The U.S. dollar is trading higher against all of the major currencies except for NZD which is supported by stronger trade data. AUD on the other hand took a hit from weaker manufacturing data. Sterling shrugged off a healthier PMI report as Brexit concerns persist and gilt yields tumble. The euro is also under pressure ahead of this weekend’s elections while the Canadian dollar extends its slide. Stronger than expected Swiss GDP had zero impact on the Franc. The U.S. releases its personal income, spending and ISM manufacturing reports this morning. We are looking for mostly softer data that could extend the slide in USD/JPY, stocks and possibly even risk currencies. NZD/CAD Back to 92 Cents? The New Zealand dollar was this week’s best performing currency thanks to higher dairy prices, stronger labor market data and the central bank’s nonchalant view on the rising currency. Economists expected the jobless rate to rise but instead, employment grew by 0.5% in the fourth quarter, driving the unemployment rate down to 4.5%. Although the Reserve Bank of New Zealand cut their GDP forecasts to 0.8% from 1.2% in the first quarter, Deputy Governor Spencer dismissed the rising currency by saying it hasn’t moved too much and they are not concerned about the level. 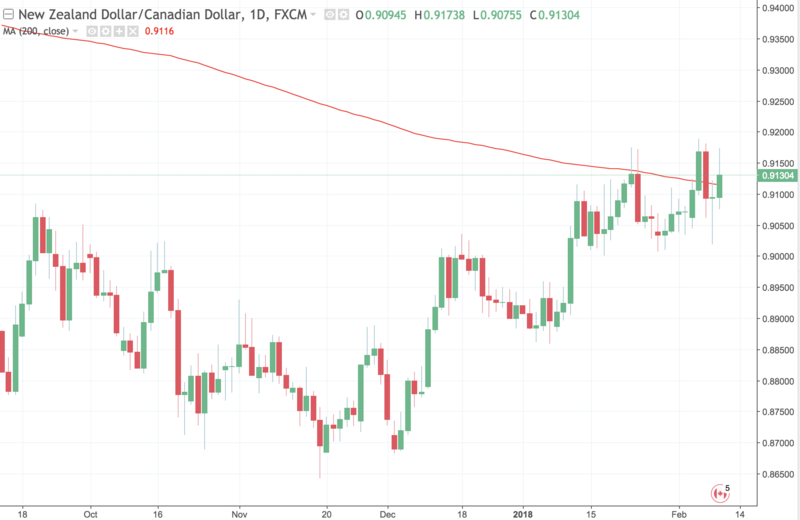 Business PMI is only New Zealand economic report scheduled for release in the coming week and given the currency’s recent strength, it should continue to outperform other major currencies including the Canadian dollar. The loonie fell to its weakest level in 6 weeks on the back of falling oil prices and weaker economic data. Everything from Friday’s labor market report to the trade balance and IVEY PMI index missed expectations. A total of 88K jobs were lost in the month of January. Not only was this significantly worse than the consensus forecast for 10K job growth, but it was also the largest one month loss since 2009. The deterioration was so significant that it drove the unemployment rate back up to 5.9%. USD/CAD shot higher in response but failed to hold onto those gains as investors found some comfort in continued full time job growth. Although 137K part time jobs were lost, 49K full time jobs were added, which could be a sign of a healthy rotation in the labor market. Looking ahead, there are no major Canadian economic reports scheduled for release. USD/CAD has significant resistance near 1.26 so if there’s a time and place for a turn, it would be in the week ahead. A potentially slower rise in USD/CAD (due to resistance) and the outperformance of NZD suggests that we should see further gains in NZD/CAD. Technically, NZD/CAD is trading back above its 20 and 200-day SMA. This paves the way for continued rally towards 92 cents especially following Thursday’s strong reversal. Should NZD/CAD fall back below Friday’s low of 0.9075, then a move back down to 90 cents becomes more likely. The U.S. dollar is trading sharply lower against all of the major currencies today with this new leg down breaking support and resistance levels for many major currencies. USD/JPY is below 110 for the first time since September on U.S. trade war worries and U.S. bond selling as Treasury yields are up sharply today. Euro and Sterling are very strong with EUR/USD hitting a high of 1.2350 following better than expected PMIs. Sterling is taking out as many stops as it can on the move upwards thanks to stronger than expected wage growth. The commodity currencies are also performing very well with the Australian dollar leading the gains. Its hard to say whether these strong moves will continue in the NY session because of the significant extensions but momentum is certainly on their side. This morning’s US existing home sales report generally does not have a significant impact on the greenback but with no major U.S. data this week and investors sensitive to any positive or negative dollar news, it could lead to a short-lived spike in volatility. The next 24 hours will be a busy one for the commodity currencies with New Zealand and Canadian data scheduled for release. The New Zealand dollar has been incredibly resilient in the face of weakening data. Last night’s trade balance report came in significantly lower than expected with the deficit expanding in the month of November instead of contracting like economists anticipated. This does not bode well for tonight’s GDP report as trade activity and consumer spending turned lower in the third quarter. The only thing holding NZD/USD up is risk appetite but if GDP misses like we expect, NZD fundamentals could finally catch up to the currency. In particular, we are looking for against the Canadian dollar ahead of and on the back of tomorrow’s retail sales and consumer price reports. 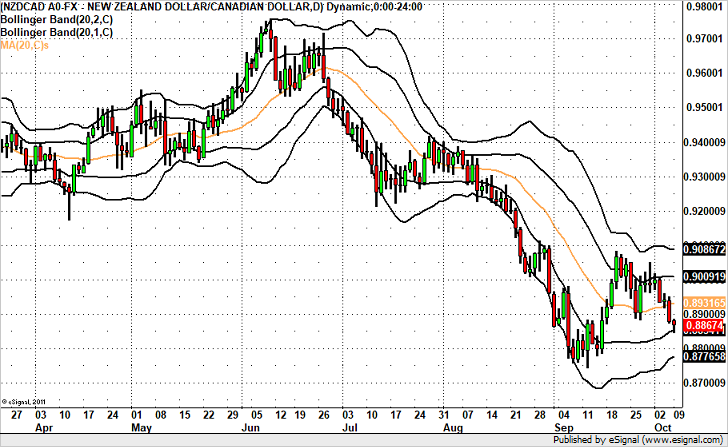 Technically USD/CAD is just beginning to turn and at risk of a deeper decline towards 1.2750. Fundamentally, today’s jump in wholesale sales signals is a sign of healthy demand while the sharp uptick in the price component of the latest IVEY PMI report points to growing price pressures. For these reasons we believe that CPI and retail sales will surprise to the upside. Technically, NZD/CAD’s failed attempt to take out 90 cents puts the pair on course for a move down to 89 cents and possibly even to the 20-SMA near .8850. This month’s high coincides with the 23.6% Fib retracement 2009 to 2016 rally. While today is FOMC day the usual consolidation before the event risk could be thwarted by the CPI report due at 8:30 NY time. The Fed is expected to raise interest rates for the third time this year but their forward guidance could be limited. The greenback is trading lower against most of the major currencies despite a modest increase in U.S. yields. Euro remains under pressure, GBP is up on the back of stronger wage gains while the commodity currencies consolidate. 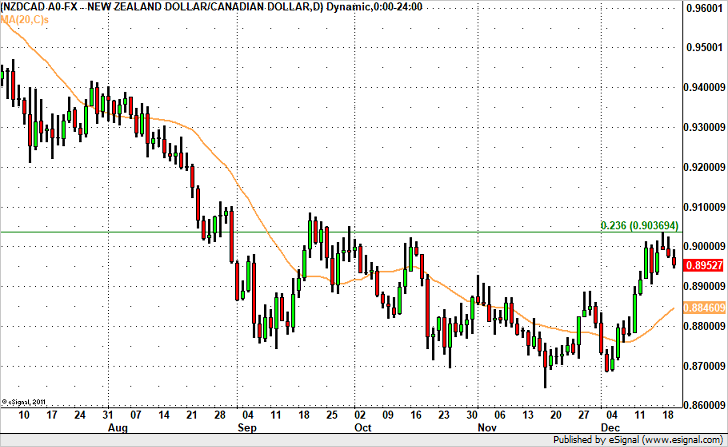 We think USD/CAD is prime for a pullback given its latest price action while AUD and NZD near key resistance. NZD/CAD has more room to fall. On a fundamental basis, the New Zealand dollar has recently fallen victim to election uncertainty, lower dairy prices and U.S. dollar strength. These issues will continue to plague the currency after the final votes are counted. The National Party led by Bill English lost 2 seats while the opposition Labour Party led by Jacinda Arden won 1. Both parties need to convince Winston Peters that it is in their interest to form a government which will be a difficult task in the days to come. Peters has said he will make a decision by October 12th but it still not clear whether that will happen. Meanwhile, USD/CAD is losing ground as CAD bulls remain in control. USD/CAD rejected 1.26 on Friday after relatively healthy Canadian data. Although net job growth in Sept was slightly less than anticipated (10K vs. 12K) and the participation rate fell slightly, full time jobs rose at its strongest pace on record. Canada has now experienced its 10th straight month of employment gains and its fastest pace of wage gains in 17 months. 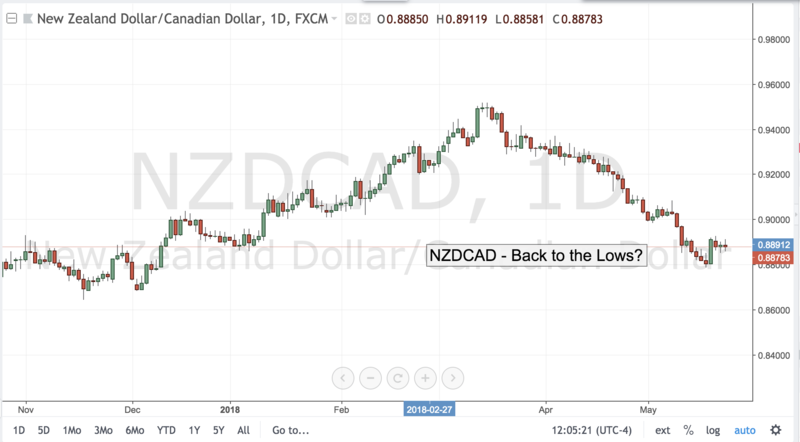 On a technical basis, NZDCAD ended last week at its lows and appears poised for a move down to 88 cents. Gains should be limited by Friday’s high near 0.8950, which is well within our stop limits.